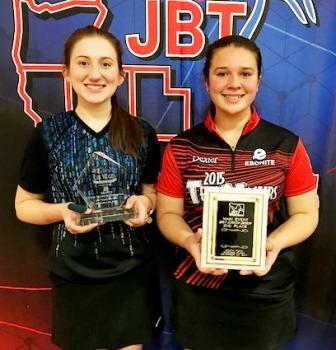 Maranda Pattison, Redwood Valley CA, defeated Crystal Elliott, Melbourne FL, to win the Girls Scratch Singles division of the 2017 JBT Las Vegas Main Event, held at the South Point Bowling Plaza. Elliott defeated 2016 finalist Bryanna Leyen in her semifinal match, while Pattison eliminated defending champ Leah Glazer in the other semi. The title match was lower scoring, and Pattison was in control of it until opens in the ninth and tenth, plus a good ball change from Crystal, gave Elliott a chance to swipe the title away with a double in the tenth. She just couldn't dial in the right hand lane though, and when the first ball went light, a relieved Pattison claimed the win and $1,500 top scholarship prize. Elliott's best ever Main Event performance earned her the $1,000 runner-up windfall. Huge thanks to Ebonite International, Priority Girl Magazine, MSC Inc, and all our other fantastic sponsors and vendors for making Main Event possible, Mike Monyak and the team at the Plaza for a flawless hosting job, and everyone for coming out to bowl. We look forward to seeing you at the 2018 Main Event, December 26-30 at the Plaza!